Office 365 users will now get a free mobile device management (MDM) system from Microsoft, as the supplier adds further enterprise features to its mobile strategy. The company has added the mobile device functionality as part of the latest update to its mobile cloud-based Office 365 subscription. Microsoft said customers on Business, Enterprise, EDU and Government licensing plans will receive the update for free. Microsoft MDM supports devices running Windows Phone 8.1, iOS 6.0 and Android 4 operating systems. The MDM feature enables IT departments to set device-level PIN-lock, detect jailbreak devices and remotely wipe lost or stolen devices. According to the technical specification, each mobile operating system offers different levels of protection, which may complicate how an IT department supports users bringing their own devices for work. Android and Windows Phone support device encryption, but this is not available on iOS yet. On Apple devices, an administrator is able to block document, photo synchronisation and backups to the cloud, but these measures are not available with Windows Phone or Android. Similarly the ability to enforce strong passwords is unavailable on Android, according to Microsoft's TechNet web page covering the functionality of its MDM product. 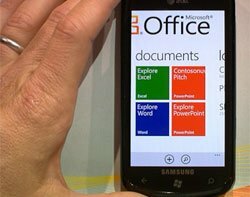 Shropshire Council has upgraded from iPads and BlackBerrys to Microsoft. Samsung has pre-installed Microsoft OneNote, OneDrive and Skype on the new Galaxy S6 and Galaxy S6 Edge. BlackBerry may be heading for the breakthrough it needs under the leadership of CEO John Chen with a new Google integration. While the new MDM functionality is a bonus for those organisations that want to add a layer of security on top of mobile devices, the real focus for Microsoft is in establishing Azure Active Directory as a cloud-based single sign-on system for managing software-as-a-service (SaaS) applications. In a blog post on Microsoft MDM for Office 365, Brad Anderson, corporate vice president for enterprise client & mobility at Microsoft wrote: "With more and more apps and services being cloud-based (eg Office 365, Salesforce.com, Box, etc), we have worked tirelessly to extend the centralised identity management and access solution, Active Directory, to the cloud with Azure Active Directory (AAD)." A number of organisations are beginning to switch back to Microsoft, in a bid to standardise their bring your own device (BYOD) policies. For instance, Shropshire Council has reworked its desktop IT strategy, making use of its Microsoft enterprise agreement to support multiple devices running Office 365.